Generator prime mover - Small Engines - Drive On Wood! Well, this is a 45kW genset and I’m guessing (haven’t spoken with the owner yet) that it’s a four cylinder engine though it could be a small inline six cylinder but, I doubt it. I figure that it would take a beefy four cylinder to turn a 45kW generator. As I mentioned it’s currently set up to run natural gas. Thanks for responding. That looks like it has a water cooled exhaust maybe this was a marine set? Now this is much different than mine because of the size but it still a very good set. You need to find out what brand of engine it has just to be sure you can get parts for it long term. And your not going to want to spend big bucks on it because as your first wood gas project you might end up getting tar in it and sticking the valves or rings. How about something smaller to start, unless this is free or near free I think its better to start smaller and work your way up. A unit this size is also going to burn a lot more fuel than you might expect. I am thinking that might be something like an inline 6 maybe a ford 300 inline. That’s a lot of fuel!!! This is part of a project to take care of the entire homestead. I have access to a smaller generator to play with until I get the hang of clean gas. 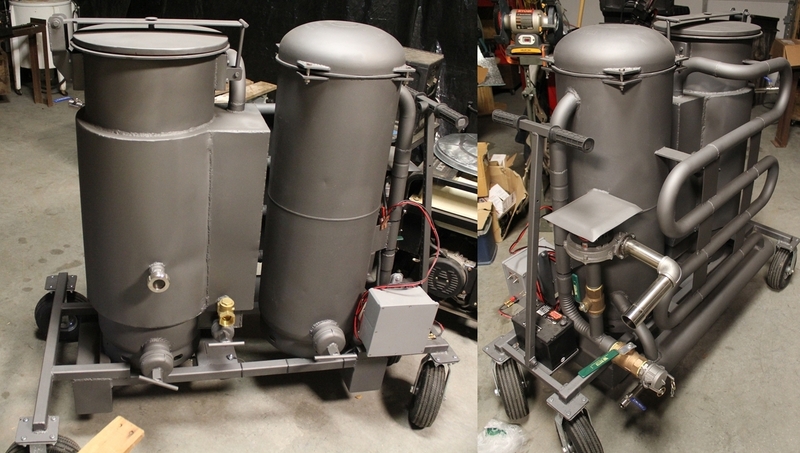 I don’t know if it’s treasonous to mention a different gasifier but, I’m building two of these Peterson designed gasifiers. When I was looking for a good design Peterson’s name kept coming up and after I dug into his design it looked like a winner. He warns that this particular design is difficult to make workable with smaller one and two cylinder engines but perfect for large two (or more) cylinder engines. He does some Youtube videos with what looks like large V twins turning the generator and says that you can expect to get anywhere from four to eight hour runtimes depending on the engine size. More if you attach an added feed hopper. I figure with two gasifiers plumbed into a single supply line I can keep the generator running long enough to charge a battery bank and run everything that will put a serious load on the generator each day (well, machine shop, welder etc). Not everything will need to run on a daily basis but it’s nice to have the ability if needed. I don’t know if it matters but the owners manual that comes with the genset is Kohler. 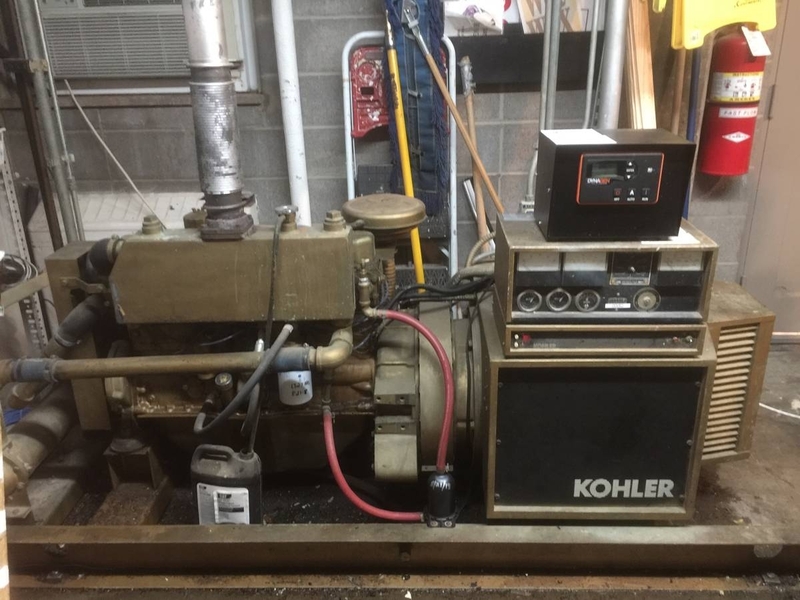 I’ll be certain to ask the owner about the engine make but, couldn’t this be a Kohler engine? I noticed the stack coming through what appears to be a water jacket and it never occurred to me that it could be a marine engine. I’ve owned two vehicles with Ford inline 300 engines and, to be honest, this engine looks to me to be about 2/3rds the size of a 300. But, I could be wrong. The engine on the genset looks to be even smaller than a 250 C.I. Ford engine in an old Falcon I owned and it was rated at around 155 HP. It will interesting to see what is powering it. One of the things I liked about the Peterson design is a programmable throttle control you can add on that helps marry the gasifier to an engine where the power demands really swing up and down. What about the conversion from natural gas to wood gas? What’s involved going from natural to wood gas? I realize that I’ll be giving up some power but if I can maintain 75% of the rated output of the generator I’ll still be in tall cotton for everything I need. Any threads you can recommend to spare your time would be appreciated. I hate asking questions that have already been answered or worse, I’m the 100th guy you’ve answered the same question for. I do appreciate your help and advice! show us the ins and outs. That will be hard to do. The heating value of the gas is low and the engine will also loose power drawing on the gasifier. The guys with more experience in this is ( like Matt he builds turn keys systems ) they will tell you what to expect. When I was looking for a good design Peterson’s name kept coming up and after I dug into his design it looked like a winner. He warns that this particular design is difficult to make workable with smaller one and two cylinder engines but perfect for large two (or more) cylinder engines. Turn down ratio the difference between full load gas production and the minimum amount of gas the system can produce that still tar free. I don’t know if it matters but the owners manual that comes with the genset is Kohler. I’ll be certain to ask the owner about the engine make but, couldn’t this be a Kohler engine? But they were old flat heads rated at less than half of what you got there. Something rated in the 90-110 Hp range probably a small six. I hate asking questions that have already been answered or worse, I’m the 100th guy you’ve answered the same question for. Nope just read and ask. I am an engine and generator guy and I don’t mind questions keep asking and I will try my best to help. Denny, I won’t be much help here. Thanks for posting the pictures, worth a thousand words as they say. Yes, I was looking at your photo and noticed all the easy cylinder counting bits are on the back side! (I think I am seeing 6) That water-cooled exhaust does imply marine or some standby application with lots of cooling water and natural gas available, like an emergency storm-water pumping system. I don’t see a radiator either. That is a large machine to experiment with, you seem to be preparing for a large system. Like @Wallace and @SteveUnruh have said, Make sure you have the fuel supply to feed the hungry beastie! I sympathize Tom. I have an old deep freeze outside, I don’t think it’s using any power at all lately. I got a pack of bacon out of there some days ago, I think it was frozen to minus 35, very, very stiff. Machinist want me to bring him in the kohler block and crank so he can take more measurements. SO I stripped it all down in the cold. If there ever was any doubt this engine is KA-PUT well this is it. And yet I got a Sisson choke and Repco ignitions, spares for the K90EP engine I have on my other little plant. Makes it look like I am doing something productive when I post pictures. I hope Wayne’s got a good deal on bandwidth and storage because I post a lot of pictures and he never says anything. In some senses the way they used to make engines makes more sense. All the strength and rigidity of the casting is built around the business end of it and so there is less flex in the block. The weakest point on these is the cylinder breaking off the cranks case in race application. Looking at the other side you see where the stator plate ( made of cast aluminum like the base plate ) attach. All of this makes for a more costly casting and fabrication. Go back and look at the Honda now and compare. The Honda is a great engine but its weakness is that gaping hole the side of the block. The stress and flex in GX crank cases means they tend to loosen up the case bolts and then the crank case separates from the cylinder in race application. Repco ignition, you don;t hear that name too often anymore I wonder if they are still in business? No matter, the interesting thing here is the points are not under the flywheel on the K series engines so its easy to tinker with your timing on them. Your not going to see too many engine with a base plate anymore. The casting methods and fabrication have changed. Wow! I wondered when I found this site if it was you and after a quick trip to Youtube I confirmed it. You’re the guy who got me interested in wood gas seven or so years ago. My ex showed me a video of one of your trucks and it blossomed from there. You’re the man! I got sidetracked with steam engines for awhile but, after exploring steam I’ve come to realize too much of the older technology was shelved for “new and improved” stuff that depends entirely on modern technology. The old steam engines and wood gasifiers should have been perfected not shelved. I suspect that tossing steam and wood gas into the trash bin of history was no mistake. Can’t have people to independent can we? It’s more than a little sickening to see how we’ve been steered away from the attributes that made this nation great in the first place. Now it’s high school graduates that can’t read, women that want to be men and men that let it all go to hell without so much as a whimper. When the good Lord takes us to the woodshed it ain’t gonna be pretty. Very pleased to have crossed paths with you Mr. Keith. Thanks for all the kind words and welcome to the DOW. Yes I have a lot of youtube videos but still have trouble getting tongue tied while trying to make them . What part of the country are you ? I may have driven through your town . I’ve got most of the parts rounded up and as soon as I get around to the assembly I may, if there’s interest, post some videos to Youtube of the process. The air inlets to the pyrolytic chamber have to be machined and I only had one set made hoping I’d have my Brigeport set up to do the inlets for the second unit. I haven’t made it that far yet so I may have to head for a machine shop to get those done. Whatever I do I’ll be most happy to share what I experience. This design got me because of what Peterson did. He built and experimented with every design he could find and ended up with a design that took all the good and chucked the bad. If memory serves me right he built six or eight different designs to come up with his. I think that he became a little dismayed that the world didn’t beat a path to his door when he began to sell plans. My opinion is that anyone, Ben Perterson or Wayne Keith, who has gotten a design to production stage is fighting an uphill battle because of the Youtube guys that cobble together a contraption to run a string trimmer engine. Peterson said in one of his videos that you never get to see the stuck valves and the mess that dirty gas makes. You only get to see the string trimmer or the lawn mower engine run but never the tear down to clean up the engine. Anyone who takes a serious look at wood gas figures out very quickly that there are some nuances (like tar in dirty gas) that have to be taken into account. It’s kind of obvious that most, if not all, the backyard experimenters aren’t telling the whole story. I’m all for backyard experimenters but I’'m also for full disclosure. I think that the parts of the story that are left out cause people to shy away from wood gas and that’s a shame. A lot of what was learned about wood gas by the end of the second world war was lost because of a pivot back to cheap gasoline. What’s been learned since then just doesn’t get the air time it needs to generate broad interest. Even though most of the design flaws of yesteryear have been, for the most part, worked out. Hard times drives innovation and I see a bright future for wood gas (all alternative energy sources really) in the near term. Things are getting squirrelly in the world and more so here at home. The only hedge against an outbreak of stupid is self reliance. It’s just a shame that guys like Wayne and Ben had to reinvent the wheel because so much was lost. Better late than never. Thanks for the encouragement and as soon as I have something of merit to contribute I’ll share what I learn. Thanks for the welcome. I live just outside of a wide spot in the road called White Mills in Kentucky. The nearest town of any size to help find White Mills on a map is Elizabethtown just south of Louisville. If you’ve traveled I-65 through Kentucky you got to within nine miles of White mills when you passed the Sonora exit. The only folks who make it to White Mills either have kin folks here or got as lost as a ball in tall weeds. I lived in Foley for a while and had I known about wood gas and you up the road in Springville I’d have been a thorn in your side (or worse). There’s nothing like learning from a guy who walks the talk. I love your website and I appreciate that you provide a place for other innovators to mingle and share knowledge. Like I said, you’re the man. The only folks who make it to White Mills either have kin folks here or got as lost as a ball in tall weeds. Your lucky when you have privacy in the modern age. When there are too many people crowded in a small place people get grumpy. But when you live in a quiet place a visitor is welcome. If you’ve traveled I-65 through Kentucky you got to within nine miles of White mills when you passed the Sonora exit. It looks like I have been fairly close a couple dozen times over the last ten years . I always enjoy seeing the big dinosaur a few miles south at Cave city . I’ve been playing catch up at your Youtube channel and I could see that you’ve been by several times. I do enjoy the privacy out here. I’m wired a little different than most in that I thrive in solitude. When I got out of the military years ago I made myself a promise that I’d never stand in another line or get bunched up in a herd. I haven’t made it entirely but, I’ve done pretty good considering. The next time you’re passing through I’ll spring for some grub. There’s a decent truck stop up the interstate north of the Sonora exit a couple of miles and if you hit it around lunch time the food’s not too bad. Give me a heads up and I’ll see if I can’t break loose to buy you lunch and shake your hand. I suspect that tossing steam and wood gas into the trash bin of history was no mistake. Can’t have people to independent can we? People are like electrons, they take the path of least resistance. I doubt that there was a master plan to cover up wood gas or that one was needed. I’ve been at this woodgas thing seriously since 2000 when I got my first computer. Because I was one who sat in a line on odd or even days to get gas during the embargo, and had read the articles Mother Earth, so one of the first things I looked up on the “inner-net” was woodgas. There were only two articles on the 'net". I kept looking over the years and a fellow finally started “Yahoo- woodgas group”. The group was fumbling with figuring out the how-to’s of woodgas. The information was never buried, but was all in foreign languages. When some Europeans joined the group and started digging through readily available info in Europe, that things started to take off. But it was hard. There was so much information to sift through with trial and error. Then Mr. Wayne showed up in a farmers magazine. He offered a tried and proven step by step instruction on how to build a gasifier. That was the big shot in the arm. People didn’t really want to read and study and trial an error construction, so they jumped to Mr. Wayne and Kris’s book and DOW web sight. Yes Jeff, and everyone after the war, there was a huge stock pile of fuel coming into the war torn counties. Cheap fuel, the people were glade to throw the gasifiers into the junk piles for a easier way to travel. And the oil lords were very happy they were doing it, just more money to go to them. But some of the wise people save them and hid them away and preserve them for us today, 70 years later. So that improvements could be made. I thank them all for doing this, and all of you for the improvements in the world of gasification for the future generations.